Also known as Colville's Glory Tree, Whip Tree and Racehorse Tree. 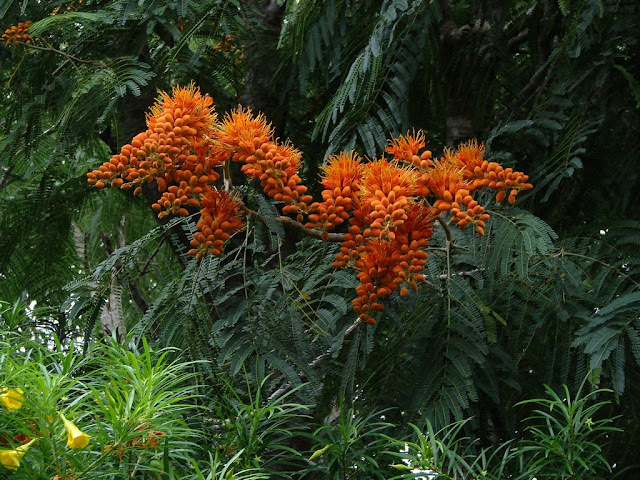 With long dense clusters of brilliant orange pea shaped flowers resembling a horse's mane, this tree has a magnificent crown with fern-like foliage not unlike a Poinciana (to which it is related). A native of Madagascar, it is an erect tree, often with a long trunk and spreading branches. It has fern-like, pinnate leaves to a metre long, with many small, elliptic to oblong leaflets. In southern warm temperate climates it will be deciduous but further north it will retain its foliage. 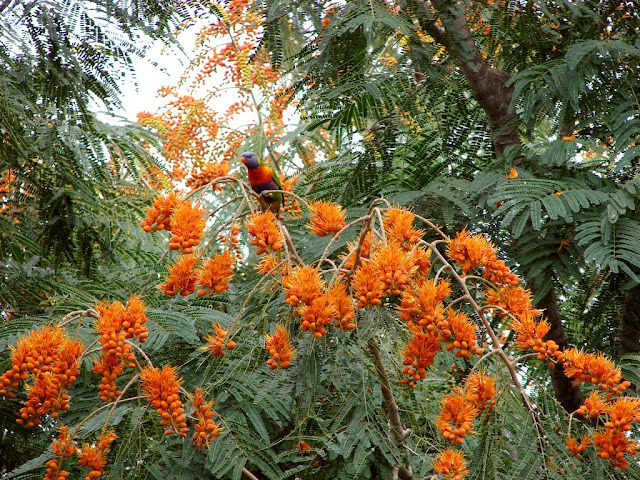 From late autumn to winter, this tree turns on a spectacular floral display that rivals other world-renowned flowering species like the Illawarra Flame Tree, Jacaranda or Poinciana, and it is a remarkable sight to see in full flower. It bears scarlet to orange flowers in racemes to 30cm in length. Its grape-like clusters of velvety buds can range from chameleon green to blood orange. This is a fabulous tree when in bloom and very delicate and lacy looking in leaf. It can grow to a height of 8 to 16 metres. Because it is a tropical tree with the same range and climatic tolerances as Poinciana it prefers moderately fertile, moist but well-drained soil in full sun. It likes to be grown rather dry in the winter but lots of water in summer - so is perfect for the Coffs Coast.